The kitchen worktops you choose will set the mood for your kitchen. Your choice will ultimatley boil down to how tough your kitchen worktop needs to be, the maintenance time you have and your budget. Here at HC Supplies, our kitchen worktops cater for all budgets and are available in a wide range of worktops thickness & worktops depth. It's important to take into account these factors when choosing your worktop, the kitchen worktops thickness you choose will have a bearing on how your worktop functions. Whether you’re looking for thick worktops or deep worktops, we’ve got you covered here at HC Supplies. We recommend you browse through our entire range to discover what we have on offer. When choosing your worktop thickness, bear in mind that ‘chunky’ worktops add a real sense of quality to your kitchen. We have a wonderful range of thick worktops for you to choose from. Our WilsonArt Buster Block Extra Matt 600mm worktop is a real crowd pleasure and is 50mm in worktop thickness. It has a delightful buster-block pattern with an extra-matt finish. For deep worktops, we have a wonderful range to choose from, each with its own set of characteristics and available in a host of materials, sizes and finishes. You'll find beautiful granite kitchen worktops, quartz worktops, laminate worktops and solid wood worktops. At HC Supplies, we believe we offer the best range of deep worktops and thick worktops at the best prices around and offer a no fuss guarantee for your 100% satisfaction. 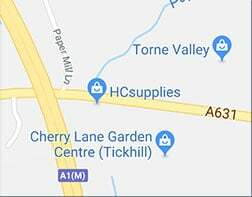 Why not visit our showroom situated in Doncaster, South Yorkshire and sample all our different worktop depths and kitchen worktops thickness? Our staff are highly experienced and friendly to ensure you get the best possible advice when choosing the perfect thick worktop to bring your kitchen to life or find out more about the benefits of installing a deep worktop in your kitchen. Our extensive worktops selection is usually available for delivery within just 2-7 working days.